Irish Separatism is a letter written by Arthur Conan Doyle first published in The Times on 9 september 1921. Sir, — I do not think that it has been brought home to the Irishman that in case the separation proposition was adopted he would himself be a foreigner within that British Empire which Irish soldiers and Irish Colonists have helped to build. His status in Australia or Canada would be that of the Russian or the Slovak — a foreign immigrant, who was there on sufferance. It would equally affect his status within Great Britain, where new-comers at any rate would have to be nationalised and renounce their mother country before they could have the vote. I am sure that there are many of us who are of Irish extraction, and who have supported Home Rule, who would view with horror such a position. 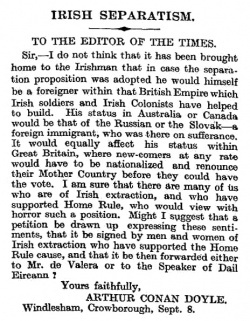 Might I suggest that a petition be drawn up expressing these sentiments, that it be signed by men and women of Irish extraction who have supported the Home Rule cause, and that it be then forwarded either to Mr. de Valera or to the Speaker of Dail Eireann ? This page was last edited on 22 July 2017, at 23:27.